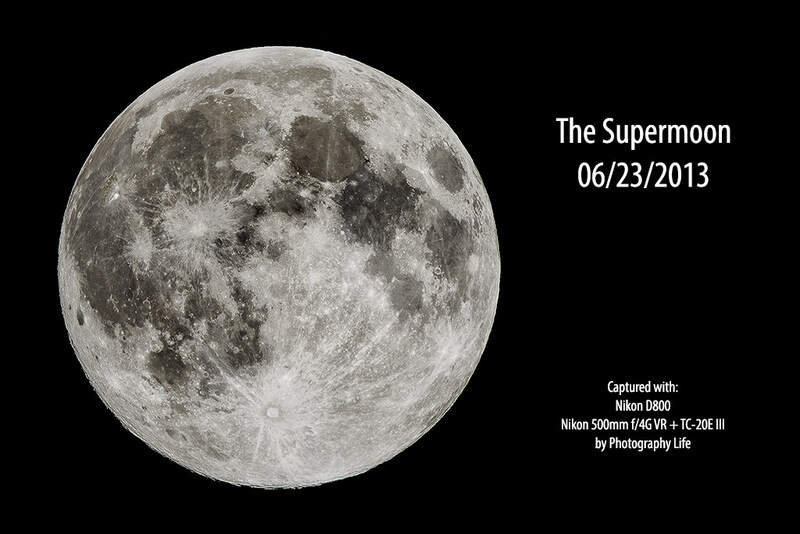 If you have not heard yet, tonight, we will experience something truly magical – the supermoon of a lifetime! That’s right, the moon will be unusually close to our planet at 356,500 km, so close that we will not see another approach like that all the way until 2034! The size of the moon will be 14% larger than typical full moon. The so called “perigee moon” will coincide will the full moon, making it appear not only unusually large, but also unusually bright (up to 30% brighter than usual). Make sure to be prepared to capture this event, since it is such a unique, potentially once-in-a-lifetime moment! In this article, we have gathered all the important bits of information you will need to capture the supermoon, so read on and let us know if you are planning to do it. How to photograph the moon – you will need to read this basic guide to understand the requirements and the exact techniques to capture the moon. How to photograph the supermoon – after you read the above, check out this specific article on photographing the supermoon. A few extra tips and techniques were added into the second article. Keep in mind that photographing a full moon is nothing like photographing a lunar eclipse. You will not have to worry about increasing your camera’s ISO, since the moon is going to be very bright. This means that if you read the above two articles, you should be able to capture a crisp image of the moon without any noise in it. And that’s with a 300mm lens + a 1.4x teleconverter! I once tried to do the same thing with an 800mm lens and boy, I had a hard time readjusting my ballhead to keep everything stable. And that brings us to potential stability issues. If you shoot with a very long lens, you should totally read my advanced article on how to stabilize your tripod. Trust me, you will need every tool in your arsenal to make a blur-free image of the moon at focal lengths above 300mm, especially if you have a shaky tripod or unstable tripod head. If you don’t have a super telephoto lens, should you skip the process of capturing the moon completely? Absolutely not! In fact, I would encourage you to still get out and photograph the moon. However, make it a challenge for yourself not just to photograph the moon by itself – try using your longest lens to photograph the moon together with a foreground subject. That’s going to be a real challenge and if you succeed, trust me, your photo will look much nicer than the moon against the dark sky. And if you have previously photographed the moon by itself with a long lens, why not make this event more challenging by thinking about a nice foreground subject? Perhaps you could drive around your downtown area to compose the moon against the tall buildings. Perhaps you could head out to the mountains tonight to photograph the moon with beautiful mountain peaks. Just make sure to plan ahead of time. My PhotoPills app is telling me that the moon will be closest at 4:24 AM and it will set at 6:33 AM. If I wanted to capture the moon with a nice background, I would have to plan closer to moonset time. Are you planning to get out tonight and photograph the moon? Let us know in the comments section below! P.S. Don’t forget to share some pics of the moon after you capture it – we have a forum for that. And typical, pouring down with rain here. Aaron, looks like it rained or was quite cloudy in a number of locations all over the world, according to the feedback that I received from a number of readers. What forum is it ? Luc, if you follow the link, you will be taken to our forum on the site. You can register and post questions, pictures, etc. there. I work tonight but I got a picture of it last night at 600mm which came out fairly well. The craters can basically be as dark or light as you want when processing so even with a lot of different people pointed at the same moon the end results still come out with some personality, even without any foreground. Patrick, I agree – everyone does the post-processing part differently, so the moon images usually do come out with their own “personality” as you’ve highlighted. Alisa, the links in the article should give you a pretty good idea on what tools you will need. Muhammad, the moon is very bright – so your AF system should be able to focus on it very quickly. It can get challenging with a wide-angle lens though, since the moon is so tiny in the frame. I’m an astronomy student and I have special access to our university’s observatory. Their telescope is 3910mm and f/11 and I, with my trusty D750, was able to get some beautiful shots the other day. The moon was so big I couldn’t get it to fit entirely in my frame so I had to stitch the shots together. But, like several others here on PL , it’s cloudy tonight :-/ so I wasn’t able to get the super moon! What a disappointment! According to EarthSky.org, the next supermoon is next month…December 14 at 0005 UTC.